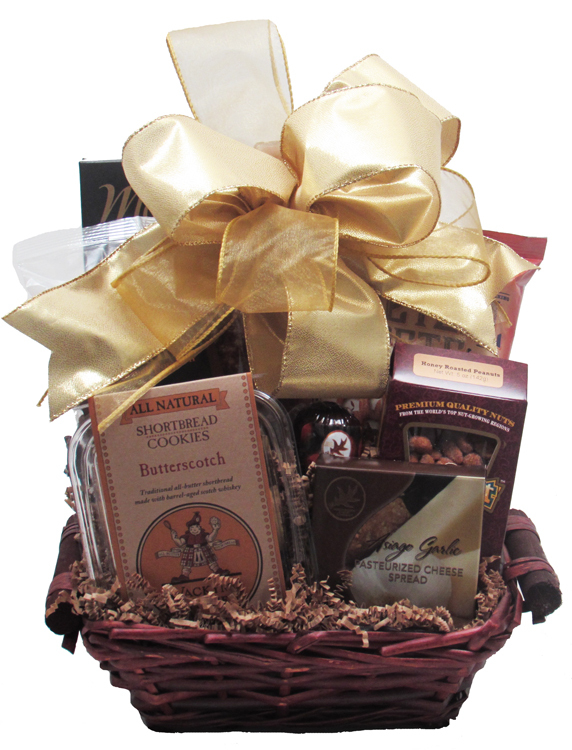 This stained willow basket with wooden handles is filled with Cheese Spread (Asiago Garlic or Smoked Gouda), box of Shortbread Cookies (Butterscotch, Cornmeal Rosemary, or Ginger), All Beef Summer Sausage, box of Honey Roasted Peanuts, Gourmet flavored Popcorn (Pecan Almond Crunch, Dark Chocolate Almond with Sea Salt, Cranberry Walnut Crunch, or Caramel & Jalapeno Cheddar Mix), Pretzel Twists (Smoky Barbecue, Salted Caramel, or Cheese Pizza), and a box of Monet Water Crackers nestled in silk evergreens. The Cookies, Peanuts and popcorn are from local Dallas area companies. Wrapped in crisp clear cellophane and topped off with a beautiful handmade bow. Includes a Handwritten Greeting Card. Finished decorated design for hand delivery approx. 15"h x 12"l x 10"w. For shipping, it is designed lower in the container, shrink-wrapped, and topped off with a smaller bow.